The economy ended 2018 on a mixed note. Growth continued to grind lower as reflected by the slowdown in exports and industrial output towards the end of the year, while inflation dipped to the lowest in 18 months on persistently low food and energy prices. But core inflation remained high, feeding into rising inflation expectations. 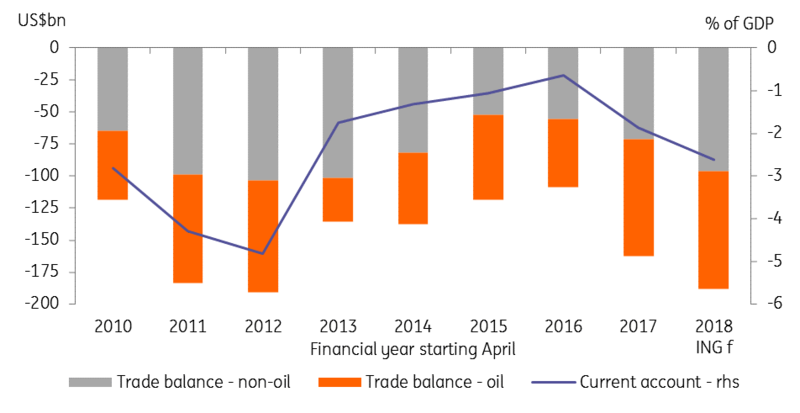 Public finances and external payments remained on weakening trends owing to high oil imports and election-related spending. The conflict between the Reserve Bank of India (RBI), the central bank, and the government over the issue of the RBI sparing more of its reserves to fund a wider fiscal gap rocked markets in the last quarter. The rift ended with the resignation of Governor Urjit Patel in early December. Just as this paved the way for a stepped-up liquidity injection into the financial system under new governor Shaktikanta Das, the fiscal floodgates opened with further cuts in the Goods and Services Tax and extra-budgetary support measures for farmers. Global market volatility spiked towards the end of 2018 but local markets enjoyed a brief respite from lower oil prices. The government bond market had its best quarter in four years in the final quarter of 2018. 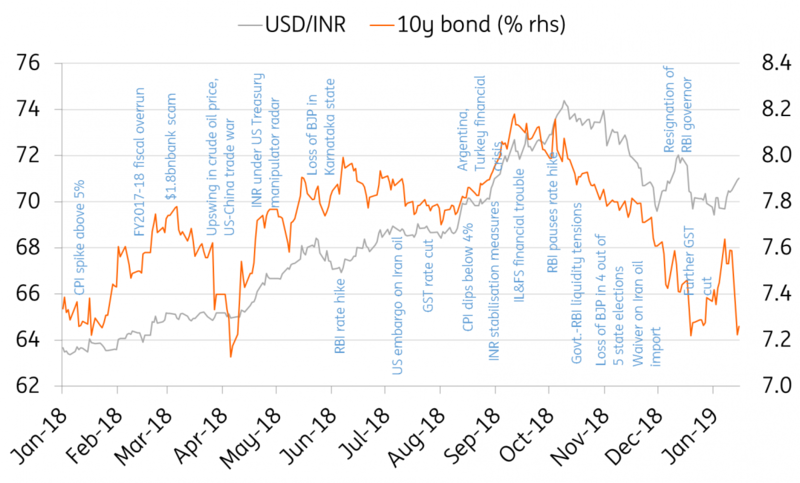 Yet a rally in the Indian rupee (INR) in November with a more than 6% monthly appreciation against the US dollar was short-lived and the currency returned to being Asia’s worst-performer in December. 2018's annual depreciation of 8.5% was the most since 2013. 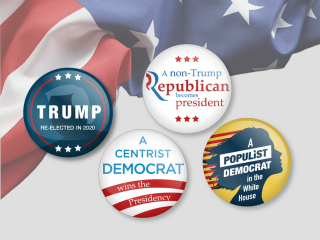 What made 2018 a turbulent year? A general election is scheduled for May this year and the environment will likely become murky as we get closer to polling day. With his popularity falling, Prime Minister Modi has reason to be concerned The losses of Modi's Bhartiya Janata Party (BJP) in recent state assembly and other by-elections have significantly diminished the prospects of a clear win for the party, while the opposition, led by the Congress Party, is consolidating its position. We think it will be too close to call. Something similar to last year’s assembly election in Karnataka state, in which the BJP came out as the winner and yet couldn’t form a government, could be imagined at the national level. 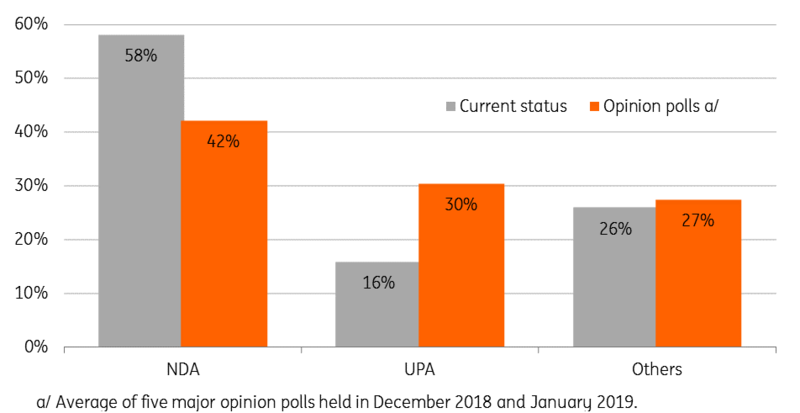 Even if the BJP retains its majority, with a slim margin over the opposition, the likelihood of the Congress-led coalition forming a new government cannot be ruled out. The opinion polls have been predicting such an outcome. If indeed the poll predictions as laid out in the following figure become a reality, a 16 percentage point loss of parliamentary seats of Modi’s National Democratic Alliance (NDA) in favour of the Congress-led United Progressive Alliance (UPA) represents a significant shift in the political landscape – not good news for the markets. An early estimate by the National Statistics Office puts GDP growth in the current financial year ending in March 2019 (FY2019) at 7.2%, in line with consensus and up from 6.7% in FY2018, a year that was marred by the effects of demonetisation and the chaotic GST implementation. Growth peaked above 8% in the first quarter of the year but slowed to 7.1% in the subsequent quarter. The latest economic data is pointing to a further drift below 7%. Hence, the 7.2% official estimate remains at downside risk - not good news for PM Modi before the elections although the final figure isn’t expected to be out until after the elections. It’s hard to imagine fresh stimulus, both monetary and fiscal, helping growth in time for the vote in May. While the economy may still benefit from stimulus in the end, the external headwinds (the US-China trade war, the downturn in technology cycle, slowing global growth, and rising oil prices) are likely to prevail throughout FY2020. We expect this to nudge India’s GDP growth below 7% in the upcoming year. However, a significant hit to GDP growth will likely be prevented by strong domestic demand on the back of the government’s populist spending measures. Meanwhile, absent significant supply-side shocks to food or fuel prices, the inflation outlook looks to be benign through mid-2019, beyond which high base effects will wear off to pull the year-on-year inflation rate higher. While the demand-pull price pressure from ample liquidity and election cash handouts could exert upward pressure on prices, it also depends on the extent the extra cash is recycled back into the economy amid prevailing uncertainty. After all, loose fiscal policy is inflationary and it tends to fuel inflation expectations. 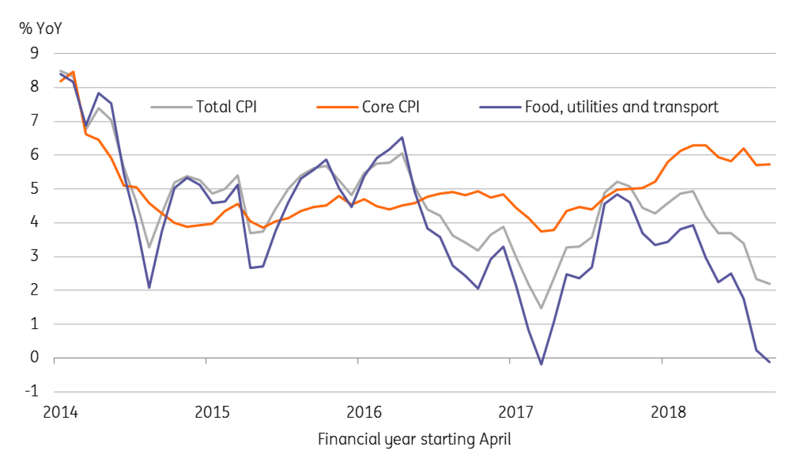 High core inflation hovering close to a 6% rate so far in FY2019 reflects elevated expectations. New RBI Governor Das has admitted that the wide gap between the headline and core CPI measures is a policy challenge. The widening trade and current account deficits will persist as drags on India’s GDP growth. Almost half of the widening of the trade deficit is coming from the oil trade. Global crude prices resumed their upward march in December and are expected to remain on that trend this year as OPEC+ streamlines supplies to support prices. This means that the upward pressure on the trade deficit will persist. Moreover, a further hit from the end of the waiver of US sanctions on oil imports from Iran in March this year could make matters worse. 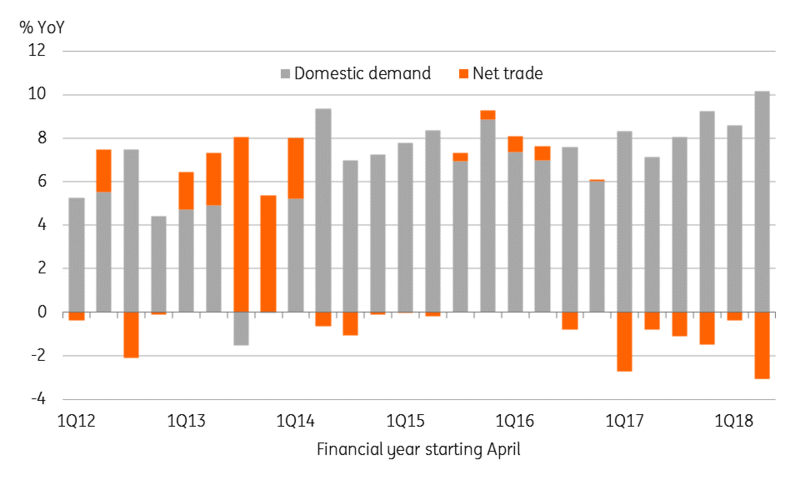 Besides oil, firmer domestic demand will keep overall imports strong, while export growth falters due to slower global growth. We expect these factors to push the current account deficit higher to about 3% of GDP in FY2020, the highest in seven years, from an estimated 2.6% for the current year, which is up from 1.9% in the last year. Meanwhile, political uncertainty could have foreign investors treating Indian markets cautiously. Net foreign portfolio flows swung from a brief inflow toward the end of 2018 to an outflow starting 2019. This does not just reflect the politics. The troubles at non-bank finance companies are far from over with media reports of another infrastructure lender defaulting on its debt due this month. 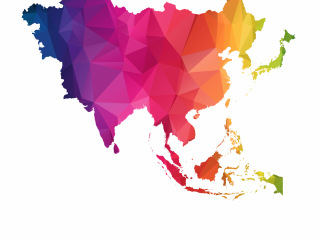 We see no near-term respite from negative foreign investor sentiment. The government’s drive to boost growth has shifted economic policies into an expansionary mode. Last October the RBI moved its policy stance to ‘calibrated tightening’ citing sustained inflation risks. The events since, especially after the resignation of Urjit Patel, have clearly shifted the bias towards easing. New RBI governor Das is likely to endorse the shift to a ‘neutral’ stance at the next meeting on 7 February. We have recently downgraded our RBI policy forecasts from two rate hikes this year to no more hikes. However, with the sustained pressure from the government to ease, we won’t be surprised if the central bank decides to cut rates in February. Before the RBI meeting, the interim finance minister Piyush Goyal is due to present the FY2020 budget to the parliament on Friday, 1 February (Finance Minister Jaitley is reportedly on medical leave). Growth will outweigh fiscal discipline as the Modi administration pushes for a second term. As such, after an overshoot of the deficit in the last financial year and more likely again in the current year, hopes of any fiscal consolidation receiving prominence in evolving macro policy are largely misplaced. 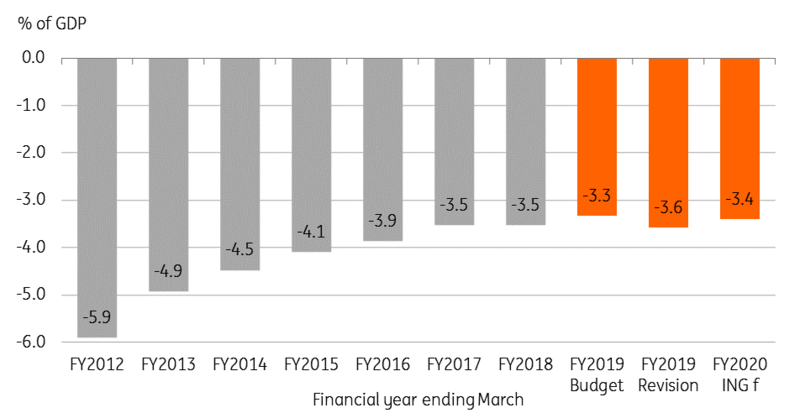 We see the revised budget for current FY2019 producing a deficit equivalent to 3.6% of GDP, well above the government’s initial projection of 3.3% (consensus 3.5%). Our forecast for FY2020 deficit is 3.4%. In the event of the incumbent government staying in power or the Congress-led coalition taking over, fiscal policy will likely remain overly loose, with the deficit likely to remain well above the 3% comfort level. We consider such fiscal-monetary policy mix exceptionally expansionary. Although the economy is expected to slow, it’s not likely to crash. A nearly 7%, India's growth puts it among the ranks of the world’s fastest-growing economies, which argues against stimulatory policies. Moreover, such a policy mix will further add to inflation, which is already under pressure from high oil prices and the weak currency. Loose financial policies are good for the people – make hay while the sun shines. But the financial markets continue to be at the receiving end of it all. Weakening fiscal and external payments and uncertainty about future policy directives to mend this state of affairs suggest that local financial assets will remain under steady weakening pressure. Government bonds may be enjoying the comfort of low inflation currently but the increase in public debt issuance to plug a wider deficit is likely to re-exert upward pressure on yields. 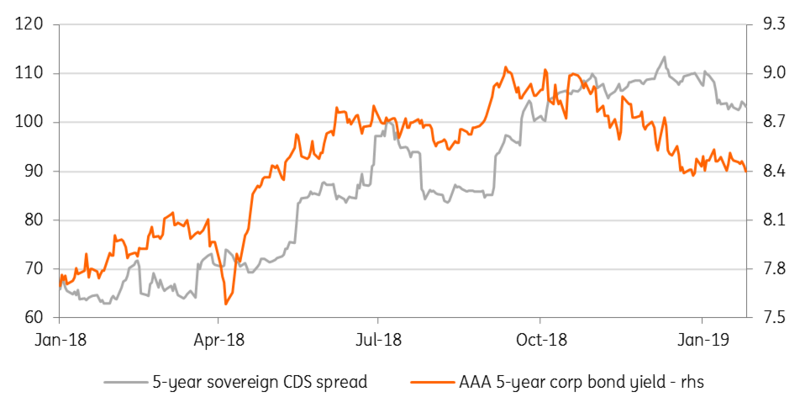 The AAA-rated corporate bond yields, as well as sovereign default spreads, have risen sharply over the last year and we anticipate no let up in these trends. All it will take is a single negative nudge from rating agencies. Relatively strong growth performance may keep any negative rating action at bay. But it also depends on how rating agencies view the government’s progress in consolidating its finances. Moody’s, S&P and Fitch all have a stable outlook on India’s long-term foreign currency debt ratings. The INR’s 8.4% depreciation in 2018 was the worst in half a decade. 2019 isn’t off to a good start either with a 2% month-to-date depreciation against the USD being the steepest among regional economies. We see the USD/INR rate re-testing 33 within the current quarter.